Last evening, I began work on other projects that I will start posting next week ... you'll see! So I only had time for this quickie project for today's posting. In my spare time (haha! ), I enjoy reading novels. Most of my current reading is either business reports (blahh! ), magazines or easy-carry on my e-reader (a Kindle). But, I still occasionally carry an honest-to-God book. I know, I know, you're asking, "Book? You mean, from the library?! Who has time for those?!" Not only am I always losing my train of thought, perhaps my mind too, but I certainly also lose my place in the book. I can never have enough bookmarks! So I came up with this fancy-fold bookmark using a folding technique like that we used to use as kids to make newspaper hats. Remember those? Fold here, tuck there and voila! So, using a miniaturized version of that on a 6"x6" piece of paper, I first punched the Double Loop pattern (by Martha Stewart) on the exposed side. This happened to be on a printed pink border on a green piece of cardstock. I gently folded where I wanted the creases to be, and then scored and properly folded the final version. This holds so tightly that no glue was necessary. 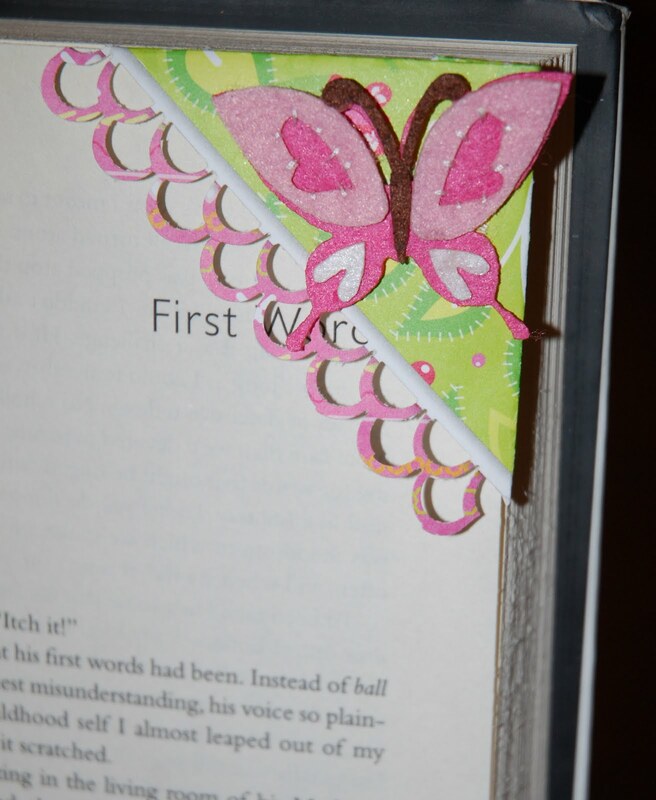 I adorned it with a Creative Charms felt butterfly, and I'm good to go back to reading. I hope you have an easier time posting comments now. I think you can post with just your name now... try it! Love your blog. You are a font of creativity. I tried to re-create the corner book mark, but cannot figure out how to make the folds. Do you have instructions somewhere? Love the bookmark. I am really going to have to make some of these. I am going to have to try this idea!